A fun winter's day was had by my daughter and I this past weekend. 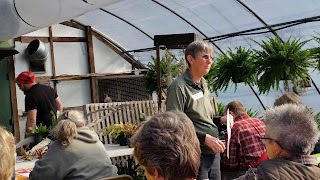 It was so nice to be sitting in a warmed greenhouse surrounded by plants and listening to a good speaker. Robin, a long-time friend of mine, owns a nursery, Robin's Nest, in the small town where I used to live. She sent out an announcement that she was having a seminar that could be attributed to Master Gardeners credits. 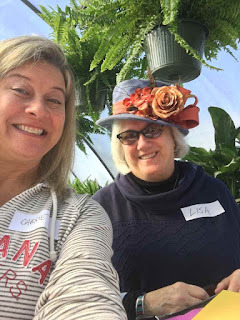 Even though many years ago I did that MG thing I don't keep up with credits but I know Robin and I knew that it would be an entertaining and enlightening seminar, and so it was. I totally didn't take enough photos. I must say that my gardeners heart was swelling with optimism for the coming growing season after we were here. We had a project to do, with choices of herbs, succulents or general indoor plants. I chose house plants even though I don't really like a whole lot of indoor plants because of the lighting situation of my house or lack there of I should say. I couldn't resist potting up the proffered pot. We had an entire rack of plant starts to choose from for the pot. All of these plants would tolerate my low lighting as the herbs and succulents wouldn't. And I might add all of this with a delicious lunch was included in the registration fee. Of course after all the arranged time we had plenty of time to browse through the greenhouses and gift shop. The business is family owned and run with a few talented and dedicated workers that have been with the business so long they are family. 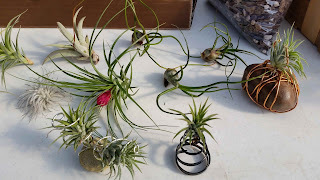 They had a display of air plants in some made up holders of rock and wire. The photo below shows just a few that caught my eye and I pictured so I would remember what they did. Believe me these weren't the most interesting but like I said I didn't take nearly enough photos. What this did do is set off a creative streak for me. I did manage to find a couple of air plants new to me. I brought them home and immediately made a few rock bases for them. 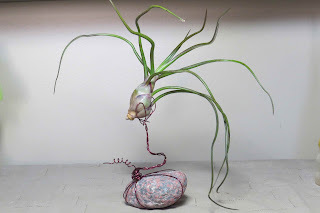 The above bulbous air plant has some red streaks on the base of the leaves so I gave it a rock with reddish splotches and a red wire to sit upon. 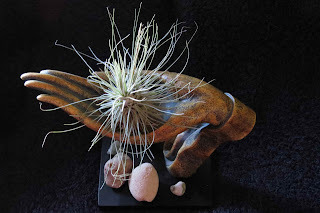 The little fuzzy air plant above is a Tectorum. 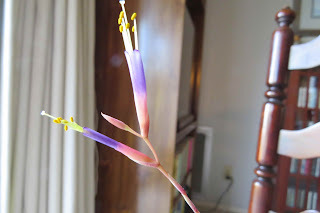 It is such a different plant from my others with those fuzzy leaves. I was so pleased that this had a name tag. 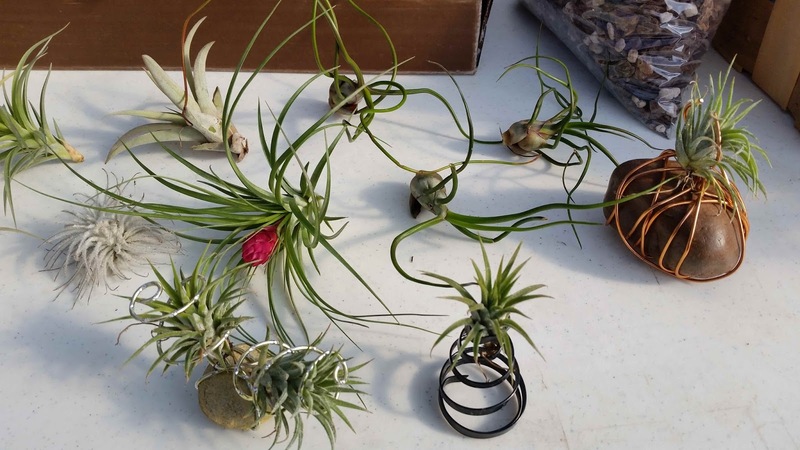 So many air plants are unnamed and it is difficult to find the names for them. 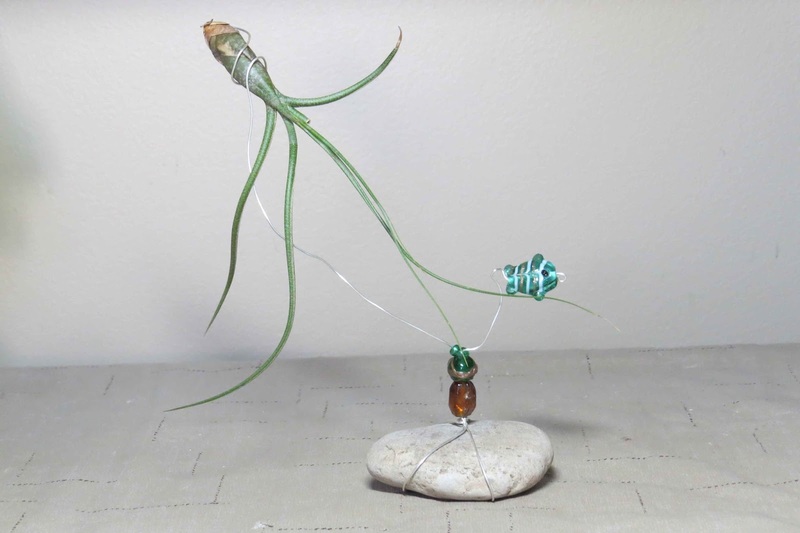 This above frilly little air plant is now residing in a hand on my desk. Last year the little darling bloomed for me. As you can see I change the resting place of my air plants from time to time so I don't glue them to any hardware. Besides I can't imagine that they like that. Just look at what you might get if you treat them nice. All of this just makes me yearn more for spring to arrive so I can get out and do some more gardening. How about you? 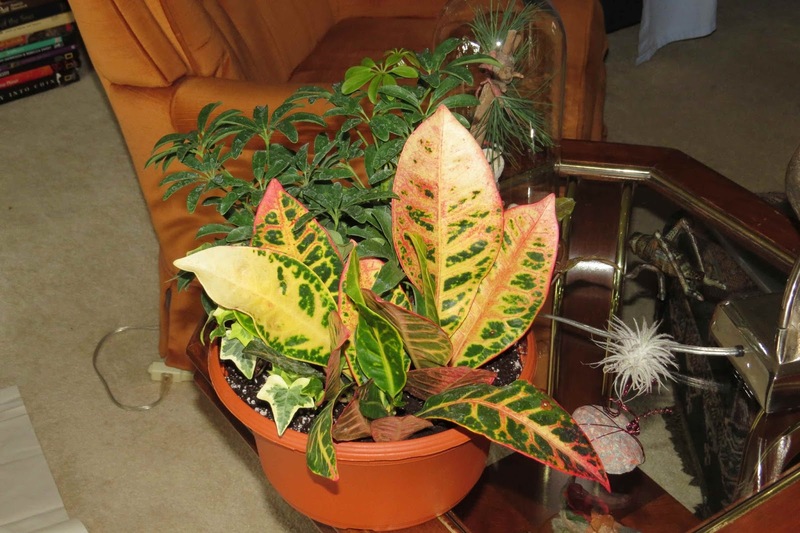 Are you growing any indoor plants or have any plans for a seminar to infuse some gardening life into your winter? Those little orchids are so sweet. Good luck. Remember when you can use rain water...maybe once per week soak those little aerial 'roots'. What color is yours? Those are so cool! I love them! Wow! 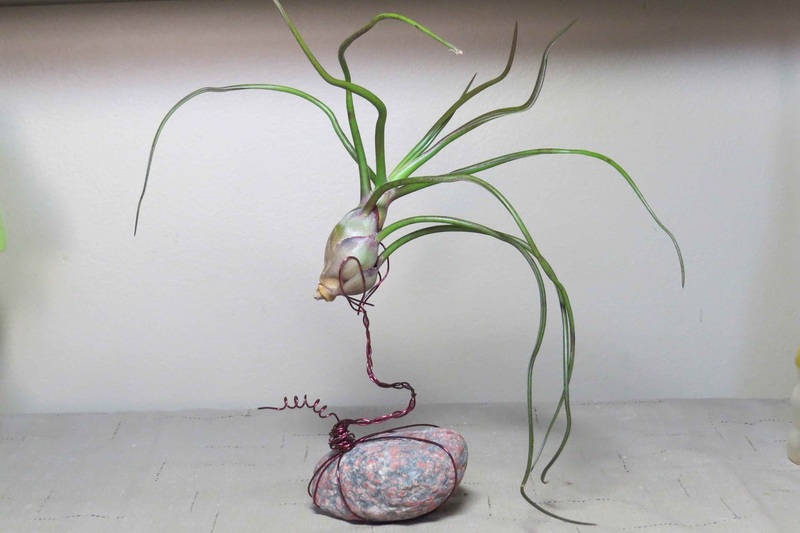 Your air plant rock stands are so creative, Lisa! But then knowing your talents, I am not surprised; you could sell these. 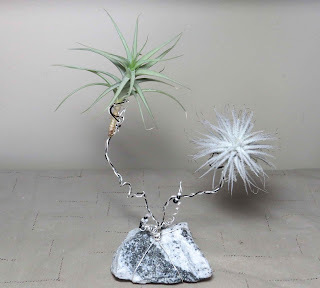 I'm embarrassed to say I've killed most of my air plants--apparently, they do need more than just air:) And I love your hat! Looks like fun! And how great to know a friend who owns a nursery. Yes,it was fun. I just wish I lived in the same town. You are so creative. The stands are beautiful. Lovely post, a pleasure to view. I am glad you liked them Cheryl. They were fun to make. 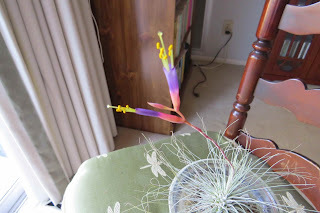 The bloom of the last air plant is a beauty. Never took care of any before. I hope I can purchase one this year. I went to our garden expo this weekend. I think your time was better spent. 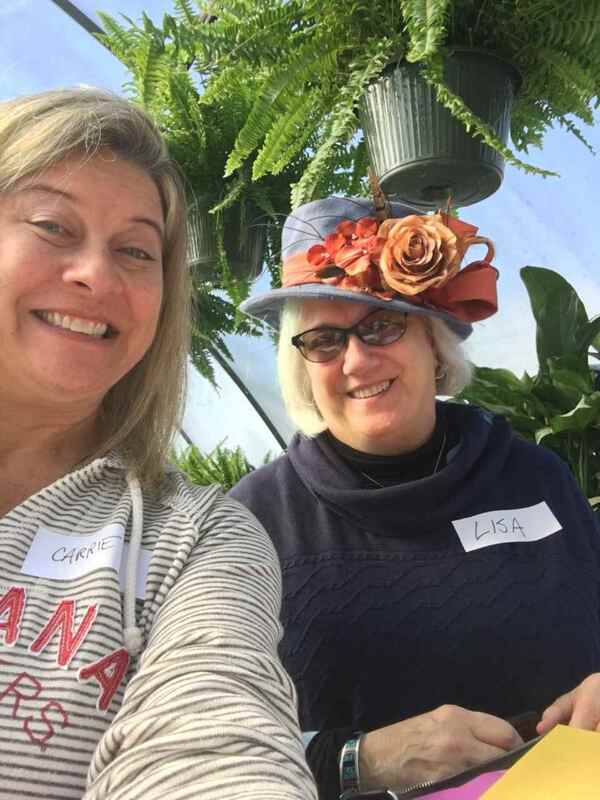 I went to some good talks but handling plants in a greenhouse would have been more uplifting. I've never seen one of those airplants in bloom! very creative - never thought of doing anything like that with them!